CRC Press, a leading science, technology and medical publisher, is pleased to announce the release of the 95th edition of its flagship reference publication, the CRC Handbook of Chemistry and Physics (HBCP). Continuing the tradition of excellence, the newest release of the HBCP, edited by William M. “Mickey” Haynes, Scientist Emeritus, features 2,693 pages of tested and verified scientific content, including the most substantive and up-to-date health and safety information, practical laboratory data, and analytical chemistry tables. The HBCP is currently available for purchase in print, eBook and online formats as well as via the online database at hbcponline.com. A cutting-edge and highly interactive resource, The CRC Physical Constants of Organic Compounds table of the HBCP is also available separately as a downloadable App, through the iTunes App Store. Originally a 116-page pocket guide known as the Rubber Handbook, the HBCP has been an essential element in scientific research and discovery for over 100 years. Relied upon by scientists in nearly every scientific discipline around the world, the handbook remains one of the most popular, respected and trusted sources for critically evaluated chemical and physical data. 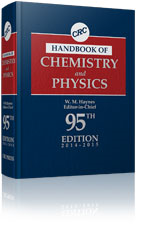 To Purchase The Handbook of Chemistry and Physics, please visit: http://www.crcpress.com/product/isbn/9781482208672. CRC Press, a premier global publisher of scientific, technical, and medical content, provides essential material for researchers, academics, professionals and students. CRC Press products include world-class references, handbooks and textbooks as well as award-winning CRCnetBASE eBook collections. CRC Press is a member of Taylor & Francis Group, an Informa business. For more information or to sign up for email alerts of newly published resources, visit http://www.crcpress.com. If you’d like more information about the Handbook of Chemistry and Physics, please contact Nicole Alves at 561-994-0555 or Nicole.Alves(at)taylorandfrancis(dot)com.